A biography of Colin Adam is in preparation. 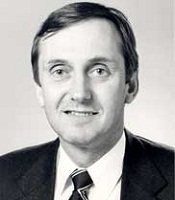 Colin Adam was an Institute Director and an Acting Chief Executive Officer of CSIRO (2000-2001). Dr Colin Adam was born in Melbourne on 6 October 1943. His father was an electrician working in the Royal Australian Air Force as a Technical Instructor. After the war, the family moved back to Queensland where Colin’s father worked as a technical teacher at The Scots College and the Post-Master General’s Department. Colin’s paternal grandfather was a marine engineer who tried in vain to interest Colin in a career in the merchant navy. Colin’s father had to move around South East Queensland to gain promotion in the PMG so Colin went to a number of schools. He recalls the influence of Miss Kennedy at Coorparoo State School who encouraged him to read widely. His longest period at any one school was at Camp Hill State High School where he graduated as the top male student.